The microalbumin test checks the microalbumin urine level. What is a microalbumin test? The microalbumin urine test measures the microalbumin level in the urine. Why is a microalbumin urine test important? The microalbumin test can detect microscopic levels of protein in the urine. This Microalbumin Test is a urine test. The microalbumin test, sometimes known as a microalbumin urine test and a microalbumin lab test, measures the urine microalbumin level. Microalbumin, as the name implies, literally refers to small amounts of albumin. Albumin is a protein that is found in the blood and usually not found in the urine because the kidney's filtration systems prevent albumin from getting filtered into the urine from the blood. However, when the kidneys are damaged by diseases like diabetes and high blood pressure (hypertension), the filtration systems can become become leaky. When leaky, the kidney allows trace amounts of albumin to sneak through its filters, leading to it being detectable in the kidneys. And so, this microalbumin urine test is looking for evidence of kidney damage (and progression of kidney-damaging diseases like diabetes) as suggested by the presence of albumin in the urine. This microalbumin test does measure the random urine creatinine level to calculate the microalbumin / creatinine ratio. This ratio is utilized by organizations such as the ADA to evaluate the microalbumin level in the larger context of one's kidney function. As a result, the microalbumin test is considered an important screening marker for people with chronic diabetes. Along with the hemoglobin A1c test and the glucose test, all components of the diabetes management panel, the microalbumin test can help identify people who need more aggressive management of their diabetes with diet, medications or both. To get a microalbumin test near you, just order online and get tested at the selected Quest Diagnostics lab. 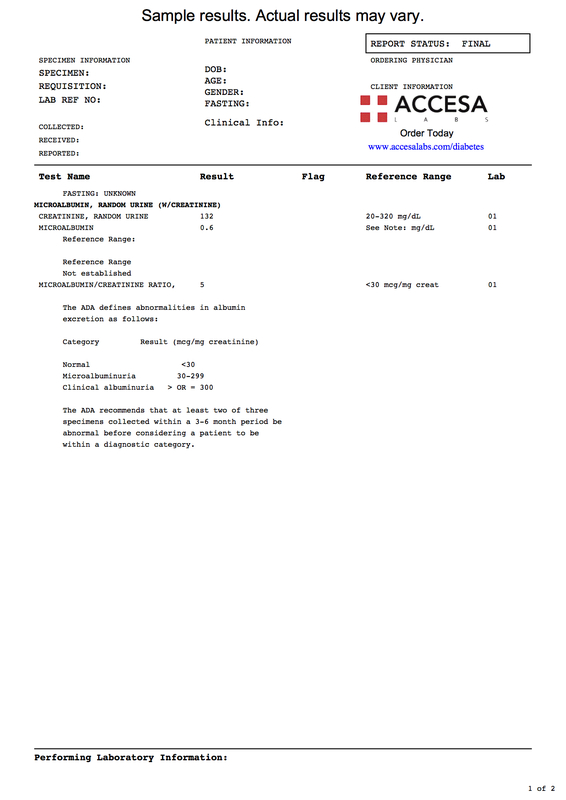 Once your microalbumin lab results are ready, they will be available for download. As can be seen on the sample microalbumin test lab report, the microalbumin level is reported as a number along with the random urine creatinine, allowing the ratio of both results to be calculated. A microalbumin / creatinine ratio of greater than 30 mcg/mg creatinine signifies microalbuminuria while greater than or equal to 300 mcg/mg implies clinical albuminuria. Microalbumin Test at Guaranteed Prices.